When you are searching for the perfect car, truck, or sport utility vehicle (SUV), Boardman Nissan has replaced those all-too-common dealership sales practices with a refreshing, customer-focused approach to selling new and used automobiles. This principle of viewing customers across Boardman and Youngstown OH as our highest priority resulted in being named the No. 1 Nissan dealer in the Pittsburgh Metro area. You can always count on our entire staff to value your automotive needs and treat you right at each visit. 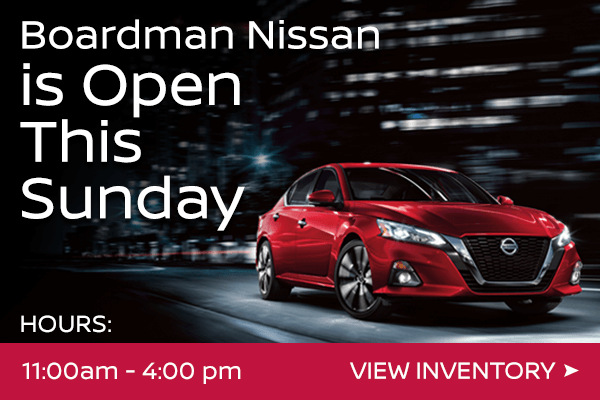 Stopping by Boardman Nissan means more than just browsing the latest Nissans in our hassle-free environment and receiving an amazing deal on your selected new or pre-owned automobile. Your experiences here truly matter, because the men and women who personify Boardman Nissan’s ideals adore Mahoning Valley. From cheering on the Boardman High School Spartans to picking up fresh food and homemade items at The Valley Marketplace and playing a round of mini golf at Sports World, we are proud members of the Boardman community and pledge to give our fellow residents the respect and courteousness they deserve while making the car-buying process a smooth transaction. If you are ready to trade up your daily ride, gives us a call at 330-726-5555 for a friendly greeting and quick responses to any of your questions about the wide range of options available on our lot or what to expect once you walk through our showroom doors. We have no doubt you will leave with a smile on your face. You may not know for certain yet which Nissan car, truck, or SUV fits your lifestyle perfectly, since there are so many outstanding vehicles to choose from for work, outdoor activities, and anything else on your schedule. Let us help you start narrowing down your favorite picks by going over a few of the most popular Nissan automobiles appearing on our showroom floor near Youngstown OH. Designed with more front headroom and cargo space than comparable crossovers, state-of-the-art infotainment systems, and optional luxury amenities like heated Zero Gravity seats, Nissan Rogue has you ready for every adventure and leaves all others in the dust. Awarded IIHS Top Safety Pick when equipped with LED headlights, Rogue also proactively prevents disastrous situations utilizing numerous safety features that include Blind Spot Warning. Looking around for the mid-size sedan that helps you live the good life while still staying under budget? The roomy Sentra was made especially for savvy shoppers who desire high-quality comforts without paying top dollar. It radiates modern style and surrounds you in fine materials, as well as combines an aerodynamic silhouette, Xtronic CVT transmission, and efficient engine to produce 37 miles per gallon (mpg) on the highway. Behind the wheel of Nissan Titan, you have the strength and muscle of a 5.6-liter (L) Endurance V8 generating best-in-class standard 390 horsepower (hp) and 394 pound-feet (lb.-ft.) of torque to tackle everything from hauling your boat for weekend fun to completing big jobsite projects fast. Plus, Titan is backed by America’s Best Truck Warranty, so you can put this pickup through the wringer knowing you are protected. Of course, these impressive models are only a tiny portion of the large lineup Nissan offers prospective buyers wanting to own a dependable new or used vehicle that makes driving enjoyable. For a comprehensive review of all their automobiles on your list, you should plan to meet with the dedicated team of Nissan experts at Boardman Nissan. We go above and beyond for each customer. Five-year/unlimited mileage corrosion (perforation) coverage. Eight-year/80,000-mile federal emission long-term defect warranty. 10-year/unlimited mileage seat belt protection. Since you can clearly tell at this point that Nissan believes in going the extra mile to ensure recent owners remain happy long after they sign on the dotted line, there is one last matter to cover: Do you want to learn everything about the specific vehicles you are interested in purchasing without feeling rushed or pressured? Then, set aside time to visit Boardman Nissan and see how we turn selecting the new or Certified Pre-Owned Nissan matching your preferences into a surprisingly pleasant dealership experience.